Intel might have accidentally revealed some details of their new 9th generation of processors last night, giving us our first glimpse at what lies beyond the company’s current crop of 8th Gen Coffee Lake CPUs. Nothing’s been announced officially yet, but a couple of internal documents that were made public yesterday mentioned a string of 9000-series processors we’d never seen before. Here’s the lowdown. The documents in question (a Microcode Revision Guidance PDF and another June 2018 8th Gen Core Family update PDF) have since been pulled down or updated to scrub all mention of these 9000-series CPUs from existence, but luckily the folks over at VideoCardz grabbed the details before they disappeared. Altogether there were six processors listed, including four six-core Core i5s and two quad-core Core i3s. Interestingly, while the processors all have 9000-series model numbers, they were still labeled as being part of the 8th Gen Coffee Lake line-up (specifically called Coffee Lake S), not the widely anticipated proper 9th Gen family of processors currently going by the codename Cannon Lake. This suggests these new 9000-series processors will still be using Intel’s current 14nm manufacturing process instead of the new 10nm process that’s due to come with Cannon Lake proper. What’s more, neither document mentioned anything about new Core i7 chips. 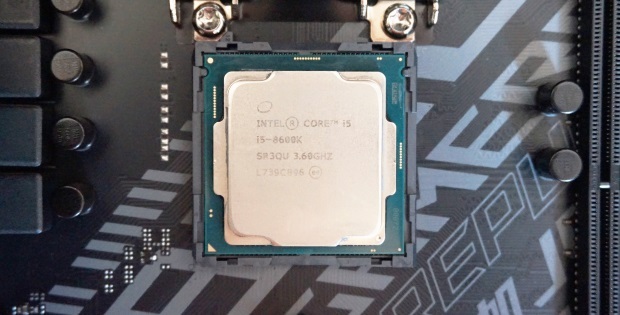 These are widely expected to be 8 core / 16 thread chips when they eventually arrive – such as the rumoured Intel Core i9-9900K – but it looks like we’ll have to wait a little longer before Intel make them official. As for what these Core i5 and Core i3 chips represent compared to today’s 8th Gen Coffee Lake CPUs, you’re really only looking at a 100MHz or 200MHz bump in clock speed, so it’s likely we’ll only see a minor boost in performance whenever they end up receiving an official launch. Otherwise, they all come with the same number of cores and threads as their respective 8000-series counterparts, and have the same TDP (thermal design point). They’ll also use the same LGA 1151 motherboard socket, but it’s not yet known whether they’ll be compatible with the same 300-series chipsets as current Coffee Lake processors, or whether Intel’s readying a whole new one for them in the same vein as AMD’s X470 chipset for their 2nd Gen Ryzen+ processors – see our motherboard / CPU combo guide for more info. It’s also unclear whether these 9000-series chips will include the proposed hardware fixes Intel mentioned earlier in the year to sort out the ongoing Spectre and Meltdown security flaws, but given Intel said these hardware redesigns would be rolling out with new Coffee Lake chips launching at the end of this year, I wouldn’t be surprised if they did offer at least some inbuilt protection.